The past five-ish(?) 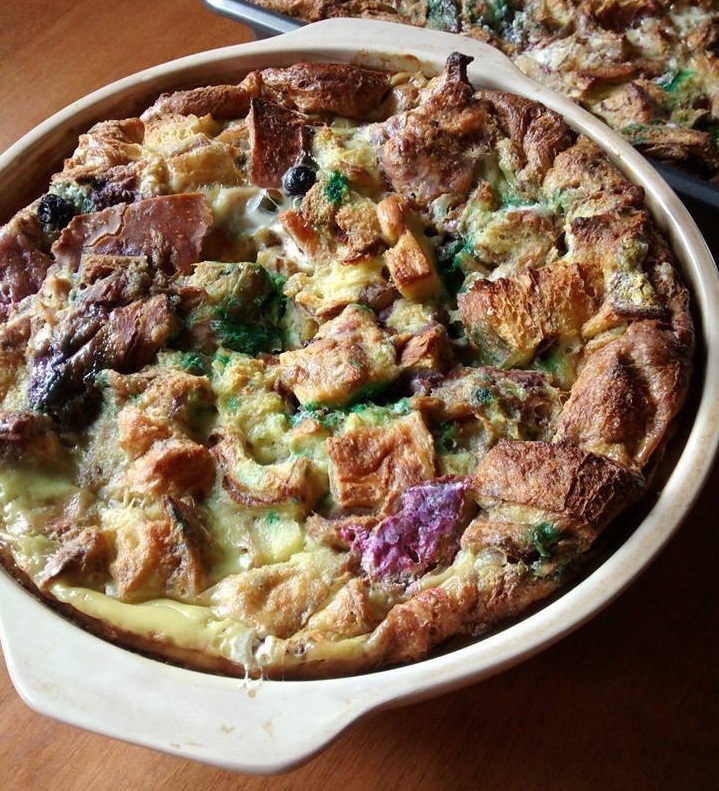 years, I’ve been making king cake bread pudding for Easter. When the idea came to me that Mardi Gras season, I was astonished that I’d never thought of this before, and didn’t know anyone else who had either. What better way to have one more taste of king cake, while still operating within the rules? I am one of those New Orleanians that does not play with king cake. You eat it starting on Epiphany and not past Mardi Gras day. As much as I love a good king cake, do not expect to see me having a bite outside of that window, even if you rename it and put some other color sugar on it. Except now in the form of bread pudding, which is a whole ‘nother game. I loved the symbolism of the king cake being “resurrected” on the day celebrating Jesus doing the same. So I started freezing pieces of king cake throughout the season and then combining them all into bread pudding for Easter day. Bonus: more space in my mouth and belly to try different kinds of king cake. And a way to help my Catholic husband celebrate the day with something special. It gradually became a tradition to invite people over for the annual eating of the king cake bread pudding. And friends also started collecting pieces of king cake to contribute to the bread pudding. Then we would all gather for an afternoon treat. But then last year, I was starting my comprehensive exams the day after Easter, so I delayed the bread pudding by a week. And then this year, MrMan and my parents were out of town not only for Easter but much of the following weekend as well. And then two weeks after Easter seemed too arbitrary for the annual eating. But then I realized that if I waited one more weekend – to this coming one – we could have king cake bread pudding for the First Day of Ridvan. Which, perhaps is the most New Orleans Baha’i thing ever. Ridvan is the festival celebrating the 12-day period in 1863 during which Baha’u’llah revealed that He was a Manifestation of God and shared the principles of the Baha’i Faith. Baha’is believe that there is one God and that He sends Individuals, in human form, to share the teachings and guidance humanity needs as we progress, with Baha’u’llah being the most recent of these Manifestations (but not the last). So we believe in Jesus. We also believe He has returned, as Baha’u’llah. Maybe next year, it will work out to have king cake bread pudding on Easter day. Or I might just shift to a new tradition of having king cake bread pudding as a way to celebrate not just the resurrection of Jesus Christ, but His return.